Their return was celebrated with a Mass presided by Archbishop Kiet. Who then left for Rome, a journey watched with concern by the faithful, who remember the attempts of state authorities to have him removed. Hanoi (AsiaNews) - After 50 years, the Sisters of Saint Paul de Chartres are back in Hanoi. 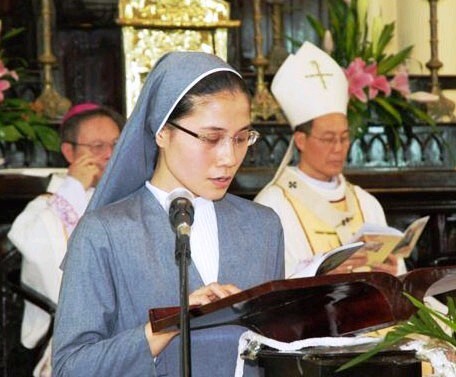 The event was celebrated (see photo) on 1 March by Archbishop Joseph Ngo Quang Kiet, together with Bishop Stephen Nguyen Nhu The of Hue, Josep Nguen Chi Linh of Thanh Hoa and dozens of priests. In what was his last public appearance before leaving for Rome – a journey that greatly worries the faithful, in light of attempts by state authorities to secure his removal, and rumours of his resignation - Mgr. Kiet urged those present to "thank God for the witness of unwavering faith of the Sisters of Saint Paul de Chartres. Their possessions were confiscated, one by one. What remained became increasingly smaller, their number has been reduced, some died, others were imprisoned. Nevertheless, the sisters have continued to serve the people with all their heart". The Sisters of Saint Paul de Chartres is an international missionary congregation founded in France in 1696 by Don Louis Chauvet, parish priest of Levesville-la-Chenard, and arrived in Vietnam in 1860, during the harsh anti-Catholic persecution of the reign of Tu Duc (1847 -- 1883). They settled in Hanoi in 1883, almost at the end of the period of 261 years, from 1625 to 1886, during which 130 thousand Catholics were killed. The sisters educate children, visit the sick and help patients in hospitals. Despite the waves of persecution, they have quietly managed to plant the seeds of the kingdom of God, hoping that it will grow, flourish and bear much fruit. Treated with great hostility by the authorities following the seizure of power by the Communists in 1954, they had been forced to abandon all their missions in Hanoi.